Handmade projects are a wonderful distraction from my PhD research! I really have no business taking time to do anything besides read theory and raise my child, but I can’t help myself. Unlike my PhD research, crafting provides a certain and finite process. It allows me to actually complete something. I won’t have that kind of sense of accomplishment with my PhD for three years, if all goes well. There is no sense of completion when raising a child, so it helps in that area also. I’m sure I don’t need a disclaimer for why I’m posting my craft projects on a blog that is primarily about more heady, hearty matters, but allow this introduction to serve as one. Maybe someday I’ll relegate all crafty things to another blog, sparing those readers who’ve no interest. Until then, please accept that I am a polymath. Or scattered. There are lots of babies in my life and there is soon to be another! This quilt was made for a little bundle expected in July. There is a secret about this quilt that I am happy to reveal here, though I’m deviously hoping the mother of its recipient isn’t reading: the appliqués are covering up a small rust stain from my iron. It turned into a happy accident, really, as I think the wee birdies are rather nice on their perches. The patterned fabric is by Amy Butler and was purchased as quilting squares from Etsy.com. The unbleached cotton is from my favorite market stall cotton vendor here in Berlin. The seam binding and batting is also from the market stalls. Gütermann brand thread always in effect on my trusty, borrowed Tchibo machine. Quilt completed and I was onto making a dirndl for my niece, Stella, who just turned one year old. A dirndl refers to traditional costume for women most commonly associated with Bavarian Oktoberfest. The term is also used to refer to a type of skirt shape in dressmaking circles, clearly stemming from this traditional style. I struggled to find a Bavarian Oktoberfest dirndl pattern for a toddler, but instead located this adorable vintage pattern from the 1970’s. With minor alteration and the right fabrics, a dirndl it became. The fabric for the skirt is vintage and gifted to me by my mother from her collection. The fabric for the blouse is unbleached market stall cotton. All other fabrics, trim, and bindings were found in the market as well. Gütermann thread, a new spool, got us through. Simply, I divided the dress, using two separate fabrics, giving the illusion of a blouse and skirt combination as is traditional. To give the illusion of a cinched bodice, I added decorative buttons and rick rack to the full apron. At the very last, I made an elasticized scarf for the wee one’s head. The look is clearly not authentic, but rather inspired by the Oktoberfest Maid’s frocks, and the long sleeves will keep her warm during evenings at the Biergarten. These vintage labels for handmade items were found on Etsy.com. After the quilt and dirndl were gifted, Lennon and I were invited to our friend, York’s first birthday party. York’s mother has shown me his baby bedroom and I thought a banner would be a lovely addition to the dreamy décor she had already included. I always like to be resourceful and found that my collection of materials was readily stocked to make this project. The fabric for the banner is sturdy, leftover cotton curtain sheeting from Ikea. The letters are made from felt yardage thrifted last year during our trip to California. Incidentally, wool blend felt is one of my most favorite things. It’s stiff off the bolt, but once washed it takes on a bumpy, textured softness that is irresistible. 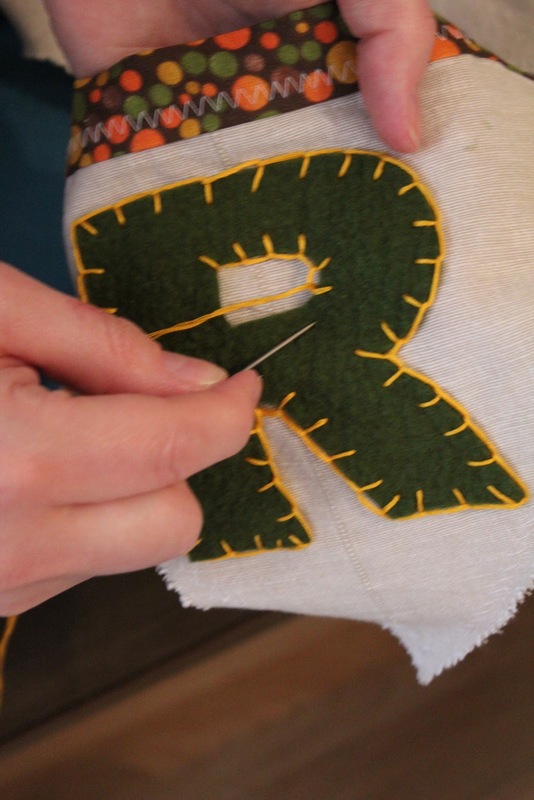 The letters are trimmed with four different embroidery thread colors from my collection, many of which came from my Grandmother Connie. The binding that holds the banner flags together was purchased from the sale bin at Joann Fabrics this April in Central Florida. Luckily for me, I still have yards and yards of this sweet binding left. Thread by Gütermann, of course. The blanket stitching on the outside of the letters was the most time consuming of the process, but a rather relaxing way to spend a bit of a Sunday.